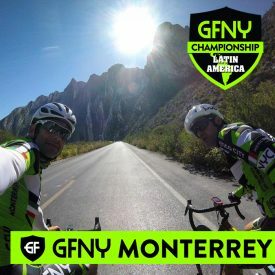 NEW YORK CITY, February 22, 2018 – The GFNY Latin American Championship 2018 will be held at the inaugural GFNY Monterrey this Sunday, February 25th. The excitement of cyclists arriving in Monterrey for the inaugural GFNY Monterrey on Sunday has reached a fever pitch. The 2018 GFNY Latin American Championship will field 1500 riders from 25 nations. The Championship course in Monterrey, Mexico will start from the famous Cintermex and race through downtown Monterrey before heading north towards Chipinque Park, where the challenging climbing begins. The long distance route of 126km has 1711 meters of climbing. A 7km climb to the top of Chipinque will be fully closed to the public as GFNY competitors navigate switchback roads and inclines up to 19%. There is a 105km non-competitive medium route available that will not climb up to the top of Chipinque. Compared to the 10% of finishers in each age group qualifying for the racer corral like at most GFNY World races, the GFNY Latin American Championship at GFNY Monterrey will offer double the spots: top 20% of age group finishers of the long route will qualify for the Racer Corral at the 2018 Campagnolo GFNY World Championship in NYC on May 20th. Monterrey is Mexico’s third largest city and offers a variety of outdoor adventures, boutique restaurants, nightlife and world-class museums – the perfect opportunity for families to travel together and enjoy a vacation before and after the race.